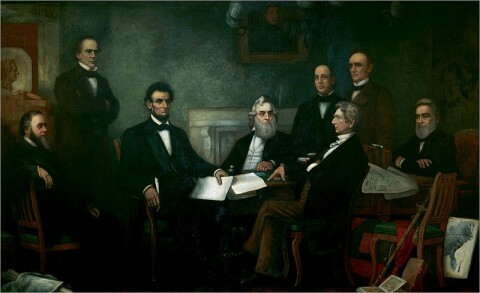 If you look closely at Francis Bicknell Carpenter's 1864 painting "First Reading of the Emancipation Proclamation by President Lincoln" (see above -- click image for a larger version) you will notice a map in the lower right-hand corner, next to the group that includes Lincoln and his cabinet. The map in the painting was a document Lincoln consulted often during the Civil War. 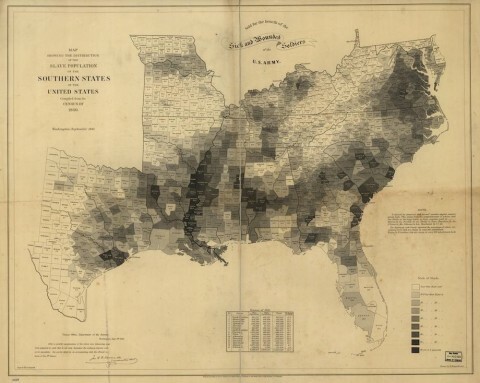 It was created by the United States Coast Survey using data from the 1860 Census to show the geographic distribution of the South's vast slave population. Carpenter lived in the White House for six months while working on his painting, and according to historian Susan Schulten, author of Mapping the Nation: History and Cartography in 19th Century America, the artist encountered Lincoln poring over the map on more than one occasion. The map reaffirmed the belief of many in the Union that secession was driven not by a notion of "state rights," but by the defense of a labor system. A table at the lower edge of the map measured each state's slave population, and contemporaries would have immediately noticed that this corresponded closely to the order of secession. South Carolina, which led the rebellion, was one of two states which enslaved a majority of its population, a fact starkly represented on the map. The map helped Lincoln visualize what he was up against. Areas along the Atlantic coast and Mississippi River, for example, are darkly shaded. The white populace in those areas was fanatically resistant to emancipation. "Conversely," writes Schulten, "the map illustrated the degree to which entire regions -- like eastern Tennessee and western Virginia -- were virtually devoid of slavery, and thus potential sources of resistance to secession. Such a map might have reinforced President Abraham Lincoln's belief that secession was animated by a minority and could be reversed if Southern Unionists were given sufficient time and support." For more on Lincoln's map, visit Rebecca Onion's post at Slate. This is pretty interesting, thank you for sharing! This map shows why U.S. Grant’s strategy defeated the slaveowners’ rebellion. Sorry, that’s not the map that caused Lincoln so much anguish. The map about what areas the Southern leaders demanded become slave states — THAT’s the 800 million headed monster Lincoln was dealing with. Do you even know Southern War Ultimatums? The map you showed was a slave density map — where slavery already existed, because of previous killings, ultimatums, and terrorizing. Lincoln, and anyone else who paid attention to US history 1800 -1865, was actutely aware of the killings and machinations that surrounded every spread of slavery. See Lincoln’s letter to Speed, to see how amazingly aware Lincoln was, down to the minutia of who was where, who was killing who, and why. There is a map Lincoln most likely referred to, but it was in his head, and he spoke of it often. We do teach his House Divided Speech, but stupidly take it as some rhetorical device — that Lincoln could not possibly mean Southern leaders were building machinery, as he called it, to spread slavery North and South, and push it around the world (in other speeches). It only sounds bizzare to us, that Lincoln would accuse Southern leaders of intentionally focusing on spreading slavery, by the most vile means, to rest of USA, including the North. Oh hell YES they did exactly that. And if you get all Jeff Davis papers, you will see it.a nd get the speeches of the US Senator who passed Kansas Act, then rushed to KS and began his own killing sprees and acts of Terror — Davis Rice Atchison. Atchison, more than anyone, was blunt and boastful, about his vow, and how he worked for Jeff Davis for “the entire South” to spread slavery into all areas, even those that rejected slavery and were already free states. There is not one — NOT ONE – high school or college teacher who teaches this basic and amazing fact. Even after Kansas rejected slavery, every after Kansas was a free state, even after Congress accepted Kansas as a free state and 90% of the white male citizens voted against slavery — Jeff Davis PERSONALLY insisted Kansas must accept — respect — and protect slavery. Davis further said the resistance to slavery was the “intolerable grievance” — even though Kansas voted 90% against slavery. This is the kind of think Lincoln — and others — well knew. Hell, the South boasted of it. Jeff Davis wrote it, in his OWN BOOK. Go read it. Go on, go read it. US Senator Davis Rice Atchison boasted he and his hired men would keep killing and keep hanging, and keep drowing, until slavery was all the way to the Pacific, including states that were already free states. That sounds bizarre, because US text books fail to show what Southern leaders did, then bragged about. They bragged they were killing to spread slavery, and spread it against states rights. That’s right, spread slavery against states rights. Learn what Southern leaders did– killed to spread slavery for GOD and boasted they would keep killing and keep spreading slavery, and they issued War ULtimatums to that effect. Then Lincoln’s words will make more sense to you. actually, Grant defeated the South for one basic reason, and if you paid attention to Jeff Davis at the time, and Richmond papers at the time, and Robert E Lee at the time, you would know this. Desertions. Massive desertions. So massive that Jeff DAVIS had to plead to crowds — mostly of elderly men and women — for them to urge the deserters to return. Did you know that? No, because no one told you. The Richmond editor, Pollard, wrote at the time, an incorrect prediction, that the Confederate loss, because of such massive desertions, would forever bring shame upon the South. Pollard, of course, had little idea of the power of repeated BS. Jeff Davis said, specifically, that two thirds of COnfederate soldiers had already deserted in 1864, and explained– probably correctly — that if just half of the deserters came back, the South could not lose. Davis also said the desertions were just as bad in Army of Virginia — Lee’s army. Lee said he army was “evaporating” and wanted to hang more deserters. Put this down –general ignorance of why South lost — as par for the course. Very little is taught now, about the cause of the Civil War, or why the South lost, because Southern apologist put out such a massive amount of nonsense which we sometimes call Lost Cause. Until they lost, Southern leaders were quite proud they were killing to spread slavery for GOD and spread it against states rights. Kind of a big deal, because not only did they boast of that, they did that. They killed to spread slavery, and they boasted of it. They boasted of it loudly and proudly, sometimes bluntly, in the case of David Rice Atchison, sometimes in Orwellian double speak. Jeff Davis own cowardice is white washed too — yes it is — go see his wife’s letter, if you don’t believe me. And her book. Is it too much to ask “historians” to read her book, wherein she say he told her to get herself killed. Is it too much to ask the same “historians” to read her letter to Blairs, donated to library of Congress by the Blair children? In that letter she tries to cover for Davis, but indvertently describes his capture, how she had to run to him, pull him to herself, and tell the soldier to leave her alone “ITS MY MOTHER”. That’s not what someone else said, that is what SHE wrote, and the letter still exists, and has been a public document, along with her book, longer than any reader of this has been alive. Also available, Davis speech about the desertions, massive as they were, which grew even more amazing after Davis tried to shame the women into sending the deserters back. Original sources make a mockery out of what the drivel is, that passes for history. I would like somebody to talk about the efforts of the slave states to organize expansion of the confederacy/US ( I don’t know if the movement was for the whole country to be expanded) to the islands and Central America and take slavery there in a more organized mannner.